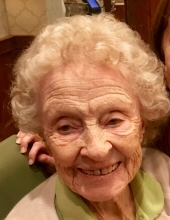 Helen Cordle was born in Birmingham, Alabama to Macon Horne Sr. and Frances Anthony Horne on February 13, 1928, she passed away on Sunday, March 31st in Florence, Alabama at the age of 91. She was raised in Bessemer and Hueytown, Alabama, where she lived her whole life. She was preceded in death by her husband, James Henry Cordle, her parents, Macon M. Horne Sr. and Frances Anthony Horne; her brother, Macon Horne Jr.
Helen is survived by her three children, Linda Cooper (Van), Albert Burns (Kathy), Jimmy Cordle (Jill); her brother, Don Horne (Carol) and Sister in Law, Clara Horne. She is also survived by her grandchildren, Vanessa Anderson, Jeff Cooper, Al Burns, Matt Burns and Jeremy Burns, in addition to ten great grandchildren and many nieces and nephews. Helen was a long time faithful member of the Hueytown church of Christ, where she attended many years. She will be greatly missed by all who knew her. Her graveside service will be at Highland Memorial Cemetery in Bessemer, Alabama on Tuesday, April 2nd at 1:00 PM. To send flowers or a remembrance gift to the family of Helen D. Cordle, please visit our Tribute Store. "Email Address" would like to share the life celebration of Helen D. Cordle. Click on the "link" to go to share a favorite memory or leave a condolence message for the family.